I almost didn't find this second record for my g-g-g-grandfather Jonas Griffin, because he was mistakenly listed (at least partially) as Josiah Griffin (and Jonah Griffin). This initial mistake was perpetuated into multiple databases (a case for careful transcription of historical records! ), but thankfully I stumbled upon it. Jonas Griffin was a Private in the 37th United States Colored Troops, Company F.
While I thought that my g-g-g-grandfather Isaac enlisted late, Jonas enlisted even later and was even older when he did so -- listed as 40 years of age. He was 5'10" and held the occupation of farmer. What was most interesting about his enlistment card was not so much what was there, but what wasn't there. 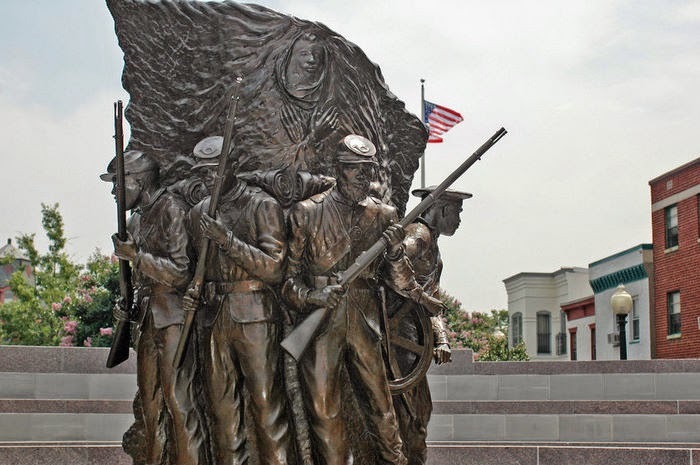 It's my understanding that many of the Colored Troops were slaves (or runaway slaves). This was usually indicated on the the enlistment card, or on the muster out card ("returned to [slave holder name]" or "Bounty paid to [slaveholder name]"). However, in this case, I wouldn't expect to see any indication on the muster out card, because slavery was proclaimed to be "over" when Jonas mustered out. The card also indicates that Jonas "joined original organization." Not sure what this means, but I recall reading somewhere that some USCT members were with their state militia before the USCT was created. But I haven't found anything to confirm that for Jonas, yet. Thankfully, g-g-g-grandfather Jonas survived the War (more on that here). But he certainly did not come out unscathed. Both he and his second wife (Rosa/Rose Yonrell/Yarrell Griffin) applied for a U.S. Pension. And boy am I glad they did! After much, much, much petition, Jonas was awarded a pension of $12/month for his lifetime. I was absolutely amazed at the sophistication of the petitions, and use of Washington, DC based attorneys, that both petitioners used to get their pensions. It required so much detail and argument. It's just not what you are taught to believe about black people during that time. 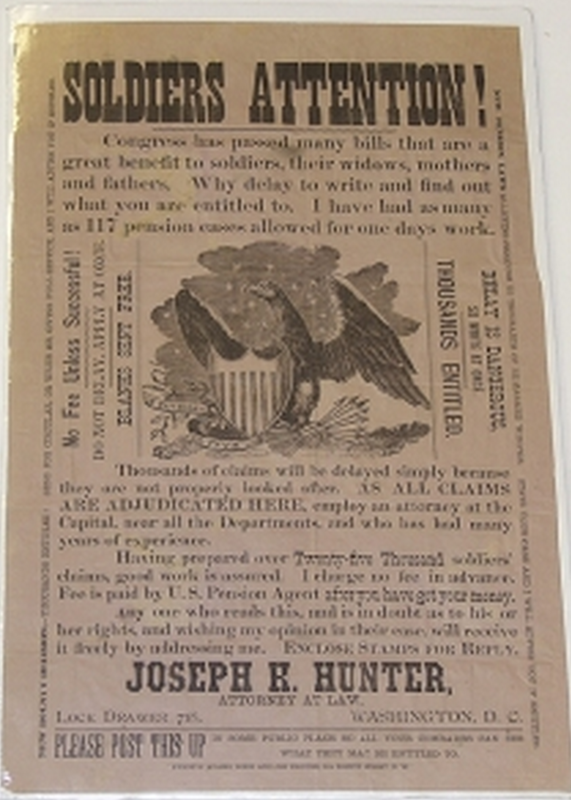 Most of the filings for Jonas were made by attorney, Joseph H. Hunter, Solicitor of Pension, Patent and Land Cases. His office was located in the Pacific Building in Washington, DC (formerly his office was at 934 and 936 F Street). There's also a reference to "Lock Drawer 718" but I'm not sure what significance that is. How cool is that! My g-g-g-grandfather was very fortunate to have retained such a well-thought of attorney. Side-note: In 1897, Jonas submitted an amended application (in an effort to get additional support). However, he had a new attorney: Henry D. Phillips, 470 Louisiana Ave., Washington, DC. Unfortunately nothing about him popped up on Google. Ca. 1870s-80s. Printed by Byron S. Adams, Book and Job Printer, 514 Eighth Street, N.W. Congress has passed many bill that are a great benefit to soldiers…Why delay to write and find out what you are entitled to. I have had as many as 117 pension cases allowed for one days work…Thousand of claims will be delayed simply because they are not properly looked after. AS ALL CLAIMS ARE ADJUDICATED HERE, employ an attorney at the Capital, near all the Departments, and who has had many years of experience…Having prepared over Twenty-five Thousand soldier's claims, good work is assured. I charge no fee in advance. 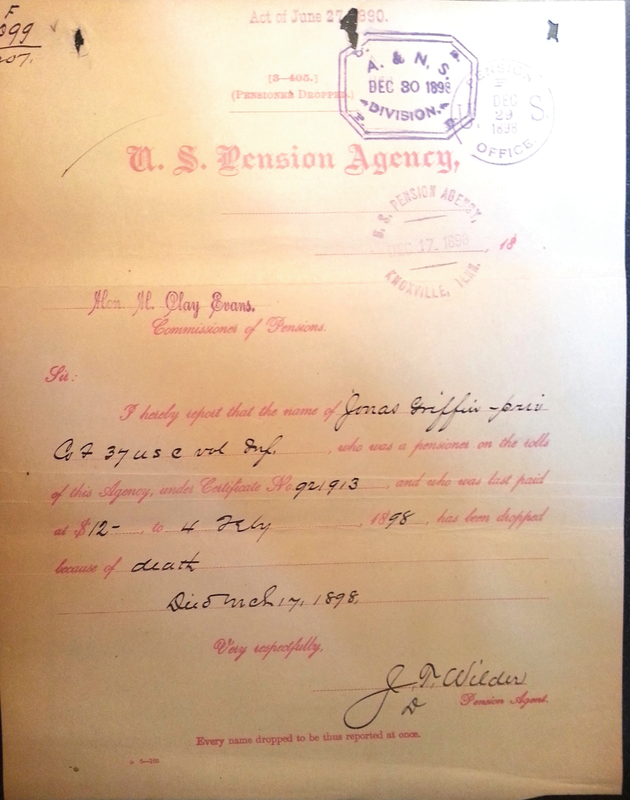 Fee is paid by U.S. Pension Agent after you have got your money…Joseph H. Hunter/ Attorney At Law/ Lock Drawer 718, Washington D.C.
Other than the realization that my g-g-g-grandfather used a lawyer to file his pension applications, the most surprising (and enlightening) information in his and his second wife's pension files, were the affidavits submitted in support of the applications. They were submitted by the petitioners themselves, as well as numerous others. These have been a treasure trove of information, and an amazing glimpse into their life. Aaron Lily stated that he had known Jonas his whole life and that he was in the same company and regiment as Jonas. He also stated he lived 4 miles from Jonas at the time. George Peal stated that he had known Jonas all of his life and that he was in the same company and regiment as Jonas. He grew up three miles from Jonas. Willoughby Lanier was Jonas's granddaughter's husband's grandfather. He also may have been a relation (brother?) of Jonas's first wife, Mary Lanier Griffin. Willoughby said that he lived, at the time, within 400 "hands" or 1/4 mile of Jonas. His mark/signature was witnessed by John R. Lanier. It is incredible how much detail, and how many hoops, were required to get approval for just a small pension. We're talking about poor, uneducated people here. I'm shocked that they made it through the process. I think it would be difficult to do even today, when we have doctors on every corner. Back then, particularly in the country out on the farms, formal medical care was difficult to come by. And to get that physician to then appear before a clerk and attest to your health, sounds almost impossible to me. I must say I was angered by how much Jonas had to go through (4 yrs!) to get even a bit of help for a condition he easily could've contracted during service to "his" country....a country that didn't even fully recognize him at the time. But thankfully he got something (~$12/month, roughly $343.00 in today's dollars, and the equivalent of $2,830/month in income - measuringworth.com). And when he died in 1898, his second wife and widow took her shot at a pension. Since Jonas finally received his pension prior to his death, his second wife, Rosa's, application should have been easy. But unfortunately for her, her marriage seems to have been on shaky ground. She also stated that she was married by N.T. Reddick, J.P. (justice of the peace?) at J.E. Moore's farm in Martin County. Rosa's application was filled with helpful affidavits as well. And one was a bit...scandalous. According to Steward Smithwick and Kinchen Gray -- who stated that they were well acquainted with Jonas and Rosa, and lived near them at the time of Jonas's death -- Rosa didn't live with Jonas at the time of his death. They claimed that Jonas "ran her off with his gun and threatened her life and she was afraid to live with him" and Jonas was "a very passion[ate] man and got mad with her because she went to church[.]" Smithwick and Gray also stated that Rosa and Jonas had been separated for four years prior to his death. 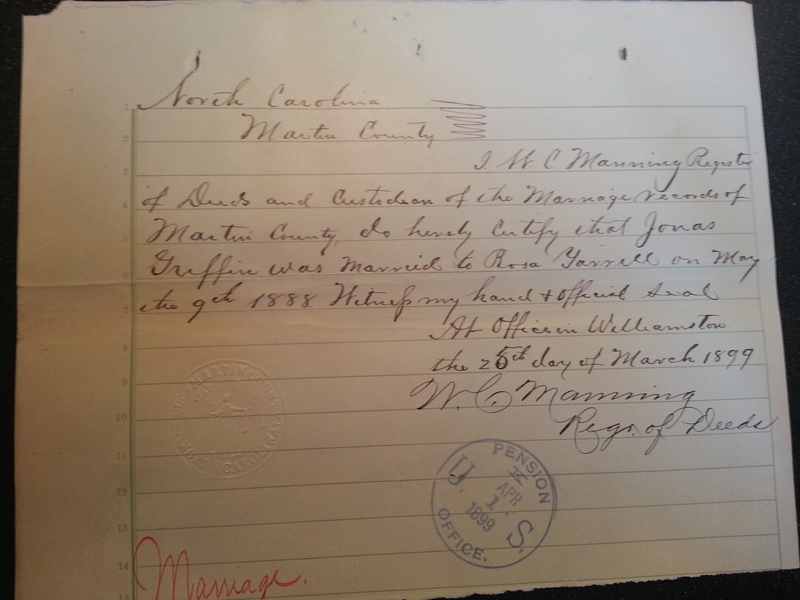 The other interesting affidavit was one supplied by Joshua L. Griffin (Jonas's son) and Mary F. Griffin on 26 May 1900. They state that they have known both Jonas and Rosa "since childhood." They also shared that Jonas had a wife during "slavery time" but that his wife [I assume this was Mary Lanier Griffin] died over 20 years prior [~1875-80]. They also state that Rosa was married to Wilson Yarrell "in slave time" but that he died about 19 years prior [~1881]. Unfortunately, that's all that was in there. Rosa died on 6 January 1907. With all of this new data, I have plenty of loose strings to pull. But I still can't help hoping that I can find even more pension applications!